The name Singapore comes from two Sanskrit words, “Singa Pura”, meaning Lion City, and dates back to the time when Indian influence was predominant. The British, who were extending their dominion in India, saw the need for a port of call in this region to protect their merchant fleet – that were plying from London to Shanghai. 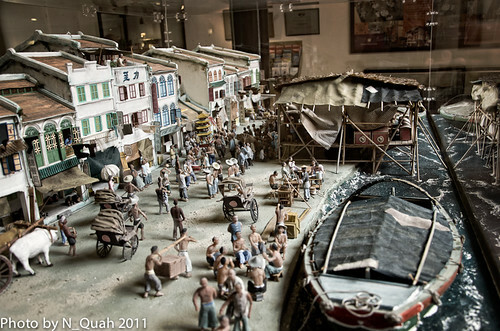 This resulted in establishing trading posts in Penang (1786) and the captured Malacca from the Dutch (1795). In late 1818, Lord Hastings, Governor-General of India, gave tacit approval to Sir Stamford Raffles, Lieutenant-Governor of Fort Malborough and the agent to the Governor General of India, to establish a trading station at the southern tip of the Malay Peninsula. On 29 January 1819, Raffles landed on the island of Singapore after having surveyed other nearby islands. 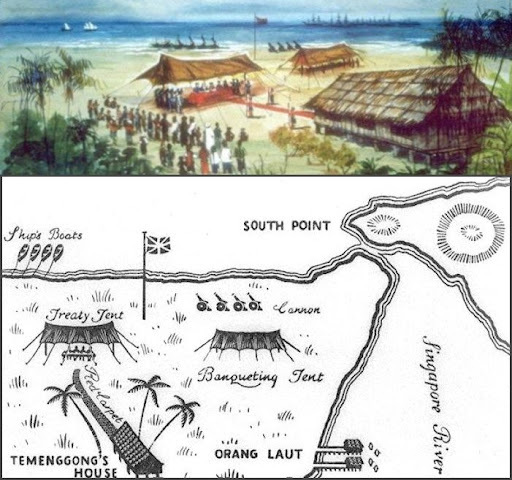 The next day, he concluded a preliminary treaty with Temenggong Abdul Rahman to set up a trading post here. On 6 February 1819, a formal treaty was concluded with Sultan Hussein of Johor and the Temenggong, the de jure and de facto rulers of Singapore respectively. Hussein Mohamed Shah to receive 5,000 Spanish Dollars annually and Abdul Rahman to receive 3,000 Spanish Dollars annually. This is in exchange for Exclusive Rights for th British to a trading post on Singapore Island. During the ceremony, the treaty was read in Malay and then in English. Singapore proved to be a prized settlement. By 1820, it was earning revenue, and three years later, its trade surpassed that of Penang. In 1824, Singapore’s status as a British possession was formalised by two new treaties. The first was the Anglo-Dutch Treaty of March 1824, by which the Dutch withdrew all objections to the British occupation of Singapore. The second treaty was made with Sultan Hussein and Temenggong Abdul Rahman in August 1924, by which the two owners ceded the island outright to the British in return for increased cash payments and pensions. Singapore, together with Malacca and Penang, the two British settlements in the Malay Peninsula, became the Straits Settlements in 1826, under the control of British India.By 1832, Singapore had become the centre of government for the three areas. On 1 April 1867, the Straits Settlements became a Crown Colony under the jurisdiction of the Colonial Office in London. With the advent of the steamship in the mid-1860s and the opening of the Suez Canal in 1869, Singapore became a major port of call for ships plying between Europe and East Asia. And with the development of rubber planting, especially after the 1870s, it also became the main sorting and export centre in the world for rubber. Before the close of the 19th century, Singapore was experiencing unprecedented prosperity and trade expanded eightfold between 1873 and 1913. The prosperity attracted immigrants from areas around the region. By 1860, the population had grown to 80,000. The Chinese accounted for 60% of the number; the Malays 13% and Indians 16%, and the Europeans, 8%. The peace and prosperity ended when Japanese aircraft bombed the sleeping city in the early hours of 8 December 1941. Singapore fell to the Japanese on 15 February1942, and was renamed Syonan (Light of the South). On 15 August 1945 with the Japanese surrendered unconditionally to the Allies bringing an end to the East Asian front of World War II. In Singapore, Japanese troops laid down their arms hence ending three and a half years of Japanese Occupation.